“Be in love with every detail. It will make you feel like your day is 100% you when everything is all put together.” We couldn’t agree more! 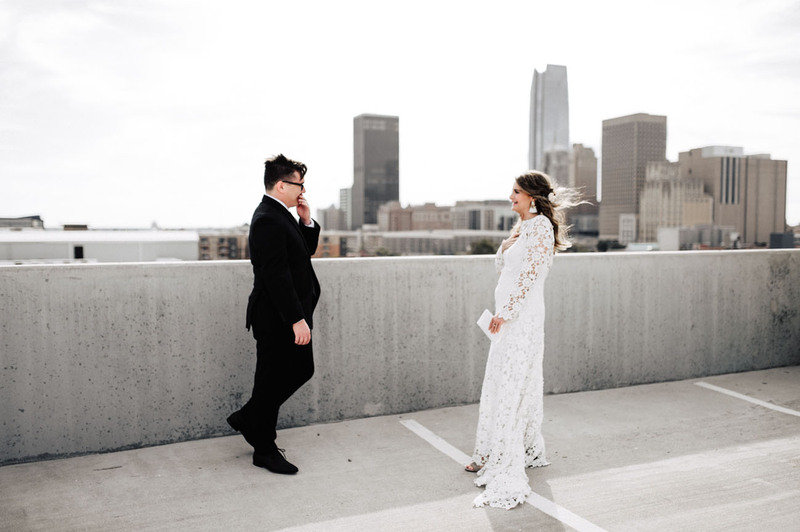 Today’s bride, Jamie, made sure that was indeed the case, and we’re so glad she did! 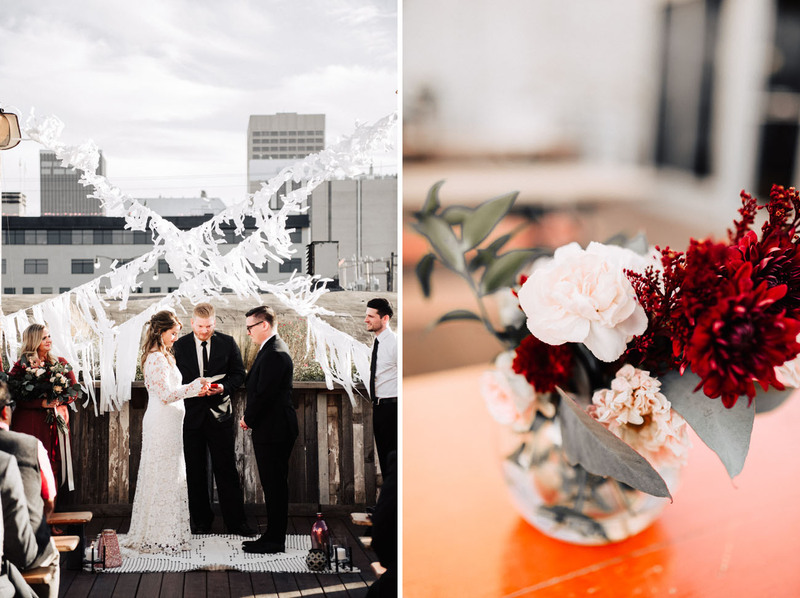 From all the DIY projects + décor pieces — the white ribboned ceremony backdrop, the photo-booth with Polaroid pictures, to the location itself — this rooftop wedding perfectly captured Jamie + Nate’s style and relationship. 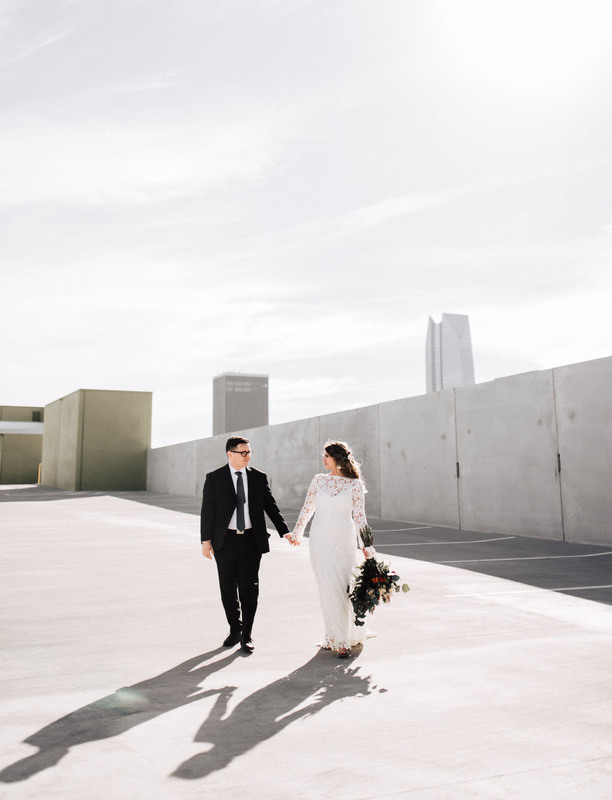 I mean, Nate proposed on a rooftop… So it only made sense for J + N to say I do on a rooftop, right?! Jamie shares with us Nate gave me creative freedom when it came to the decorations because well, I’m better at it. (His words, not mine!) The inspiration was just a mix of all the styles we love. 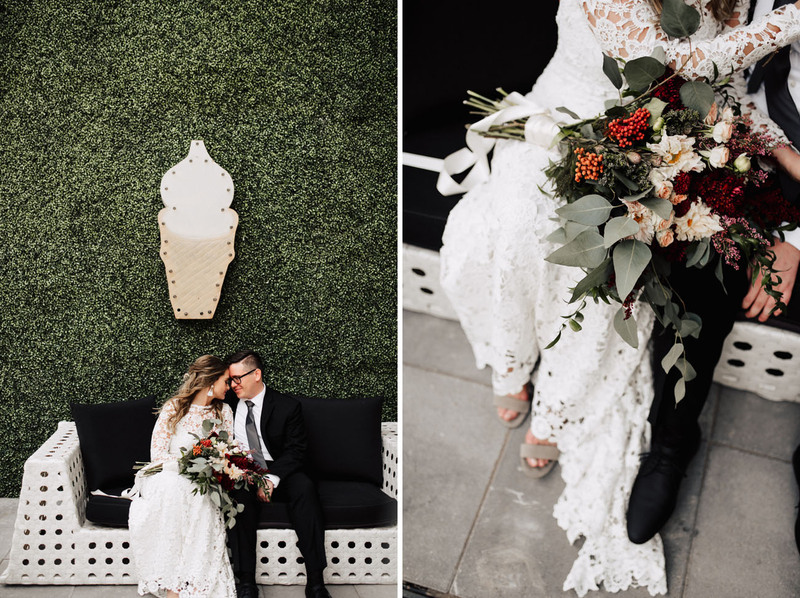 I love Moroccan styles, black and white, simplistic things, modern, urban, cool patterns, typography, fringe, marquee lights – all that rolled into one. I love DIY projects and crafting so I made most of our decorations reflecting that. I bought decorations like vases, lanterns, rugs, tapestries and just went wild with it. 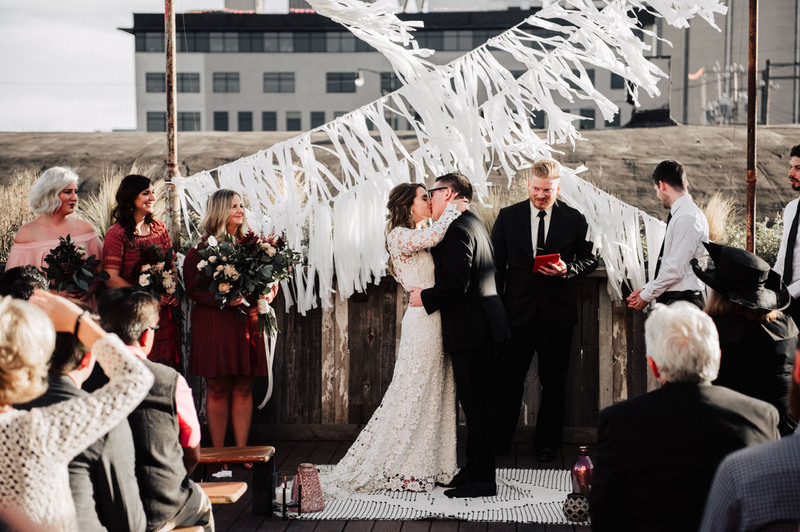 The hardest question I got asked in wedding planning was “what’s your color scheme?” I could only answer with “Anything pretty!” I had so much fun with the decorations and now we get to use it all to decorate our house with! Ready to see how it all came together? 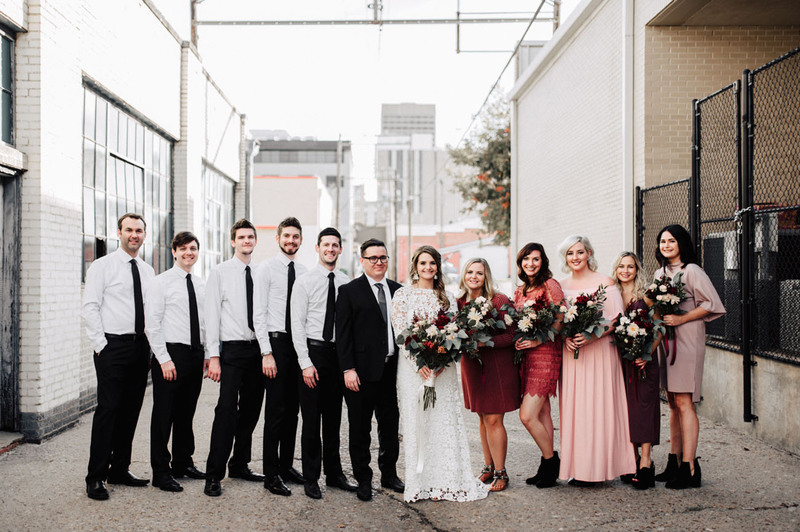 Let’s take a look at all the gorge, photographed by Peyton Rainey Photography! 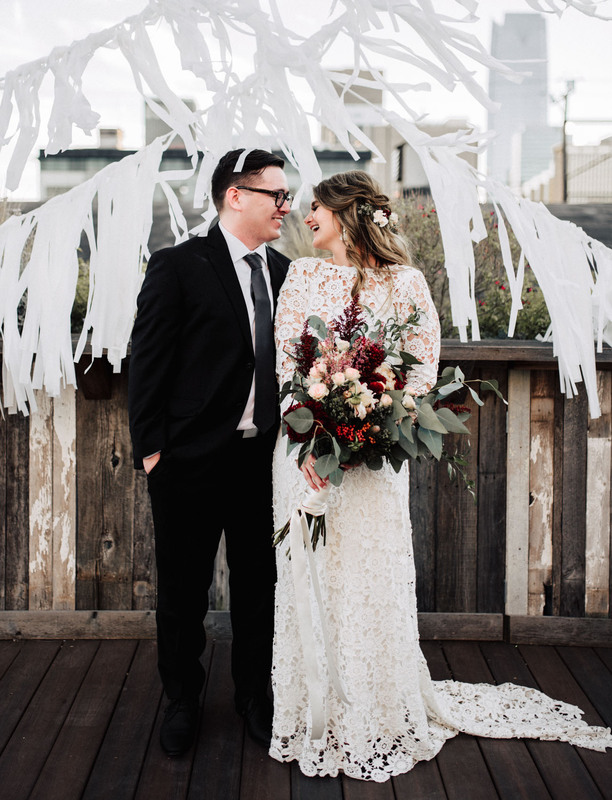 All the feels during their first look! And that view!! 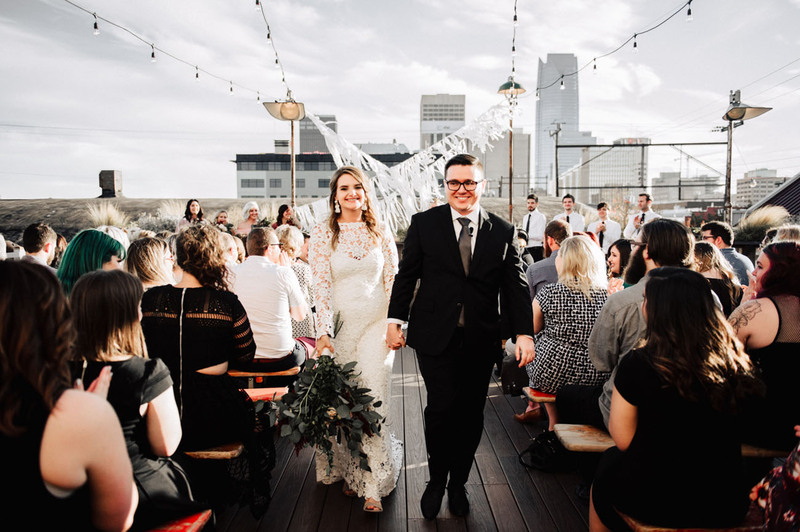 Their chosen rooftop was on top of a local store — Plenty Mercantile — in downtown Oklahoma City. The first look. 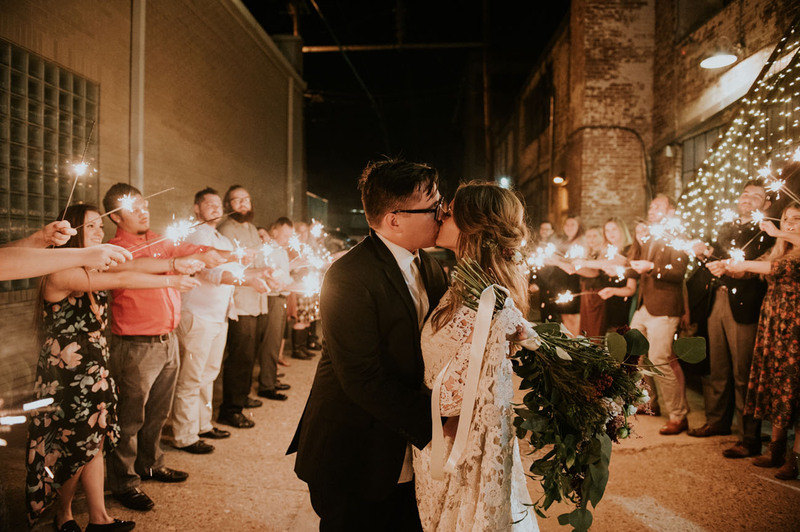 After our rehearsal dinner we agreed to not see or talk to each other again until we did our first look. We both missed each other like crazy and it made our first look so much more powerful. I remember standing there looking at Nate with his back to me. It was an experience like no other. I felt like we were the only people in the whole world. All of my stress from getting ready that day melted away immediately. He was standing there, waiting for me to tap him on his shoulder, a few hours before saying his vows to me. It was an amazing reminder that we are meant for this. We are good by ourselves but far, far better together. It was powerful. The ceremony and reception were also amazing. It’s crazy how loved you feel when you look out at the sea of people sitting there supporting you, celebrating you, and loving you! We had all the warm fuzzies in the world. 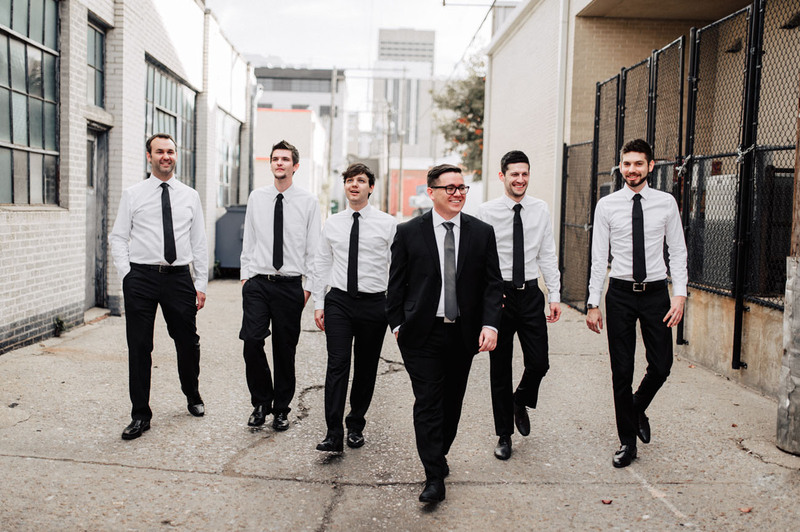 And the reception was just the best dance party we’ve ever had. 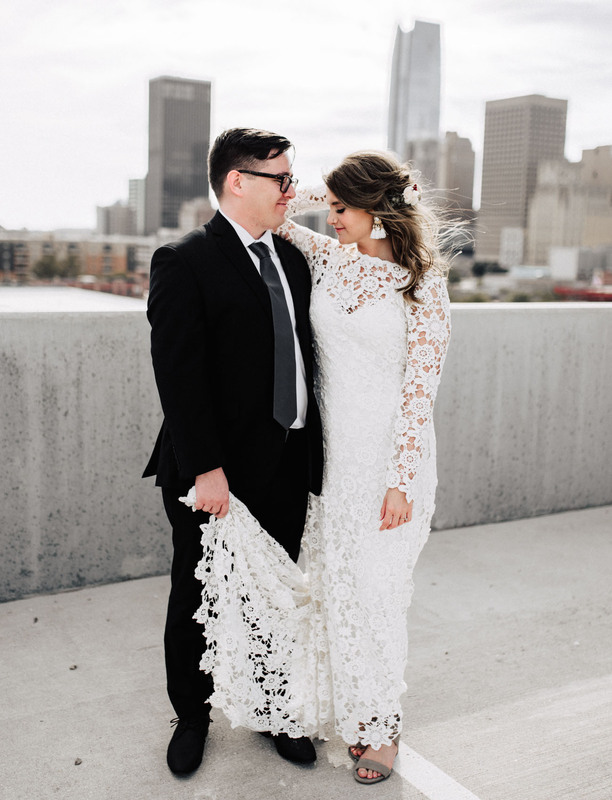 Jamie’s stunning crochet dress is by Dreamers and Lovers. 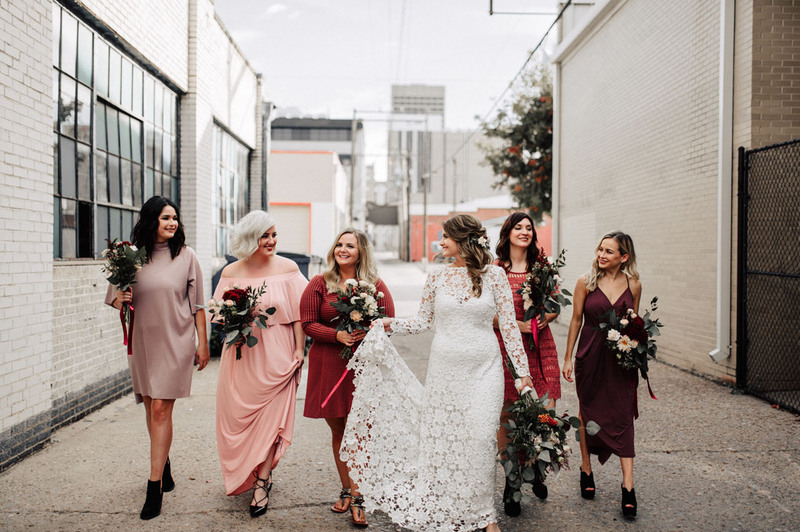 We’re LOVING the mismatched bridesmaid dresses in rich fall hues. 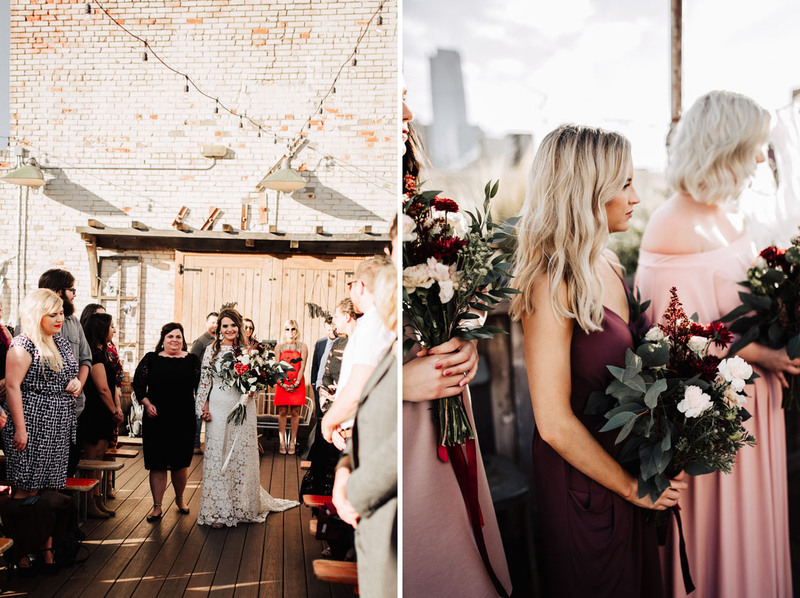 Jamie + her mom created all the bouquets! Jamie shares Don’t put yourself in a box when it comes to decorations, color schemes, or traditions. Do what you and your significant other want to do and do it WELL. 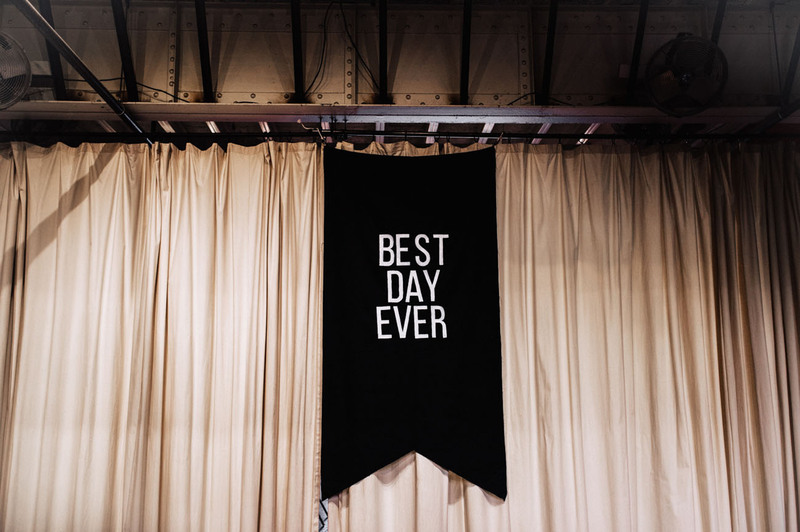 Get your day of timeline ironed out early and make sure you allot time in your getting ready process to have a small cry fest with your mother or whoever – because it happens!! Do anything you can as early as possible! Don’t stress about the tiny details. Ask for help and LET people help. 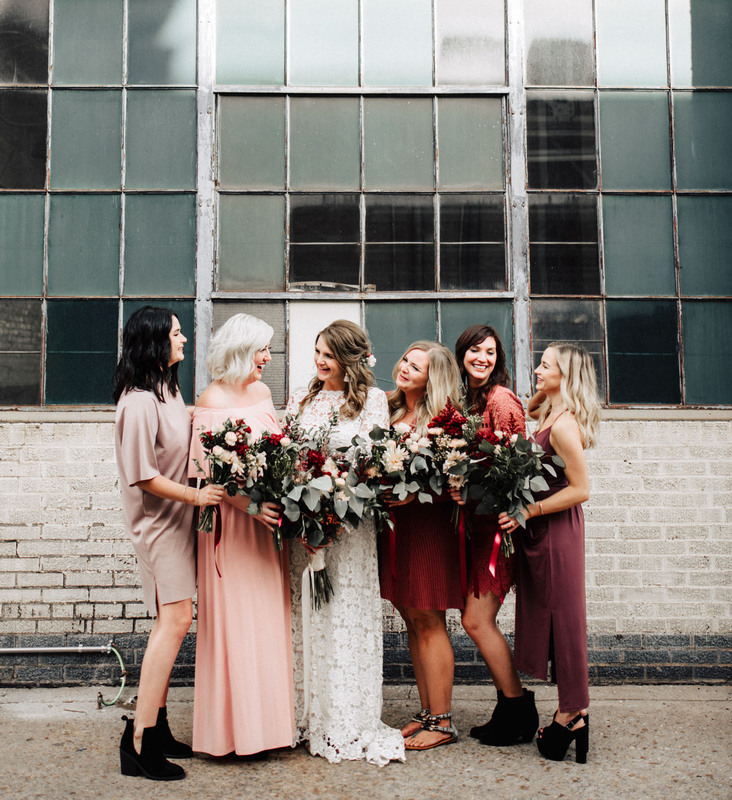 Hire a day of coordinator or ask a fabulous friend to do the coordinating for you. 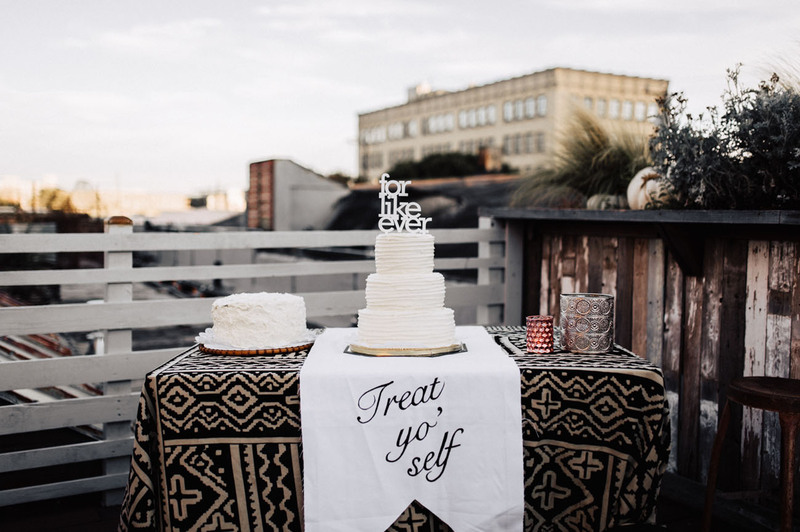 Pamper yourself, spend time with your significant other, and try to enjoy every part of wedding planning because it really is such a special time! Additionally, try to find humor in the parts that go wrong! Nate and I made our own wedding invites + spent a fun day together printing them out and cutting out 200 of them... 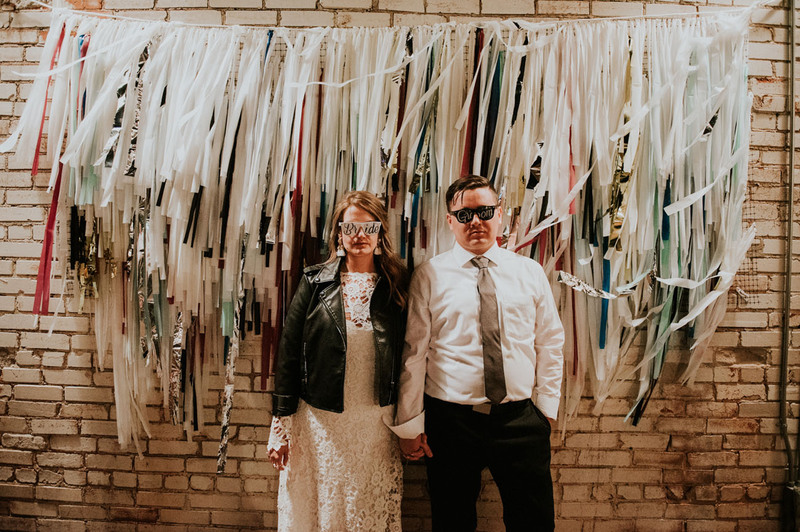 The next day I dropped them off at the post office and didn’t realize until a few days after that I had accidentally put the wrong year on our invites. I called Nate and we had no choice but to laugh about it and hope people wouldn’t notice since WE obviously hadn’t after carefully cutting out each one. Luckily not a lot of people did and from then on I sort of felt a little bit more laid-back about things. I kept reminding myself that as long as Nate and I are married at the end of the day, nothing else matters! 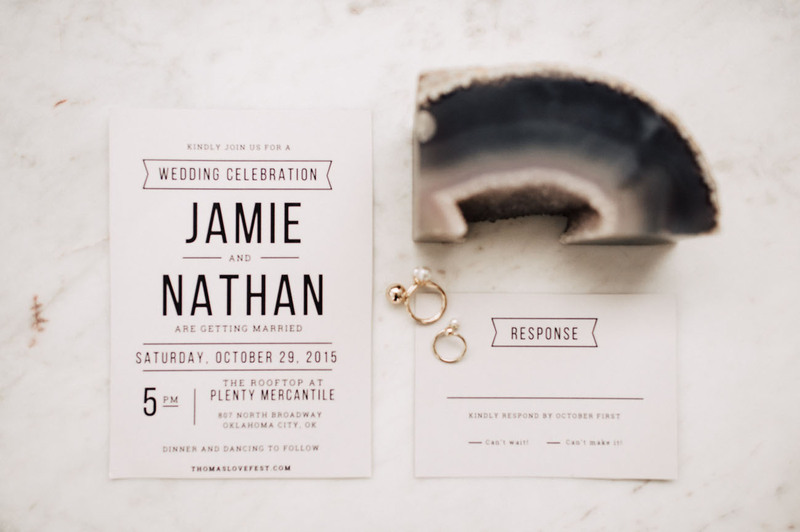 From the team here at GWS, congrats Jamie + Nate!! 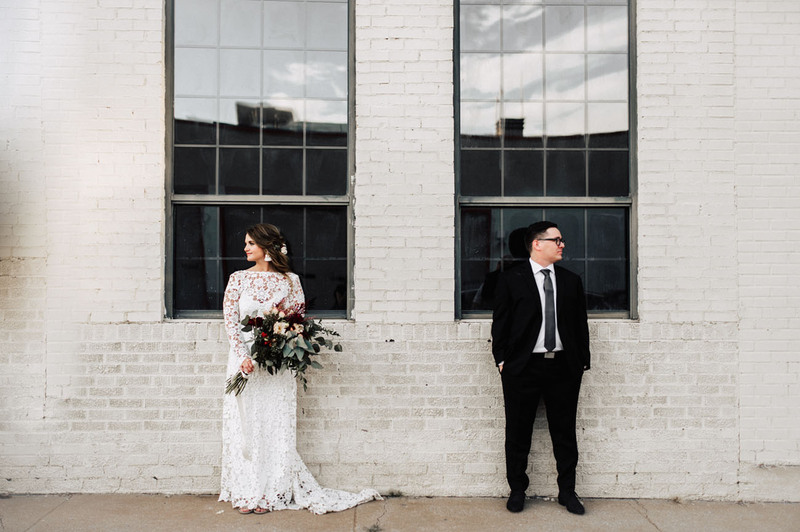 Made my day , beautiful wedding and photography. So inspiring.. Love it. 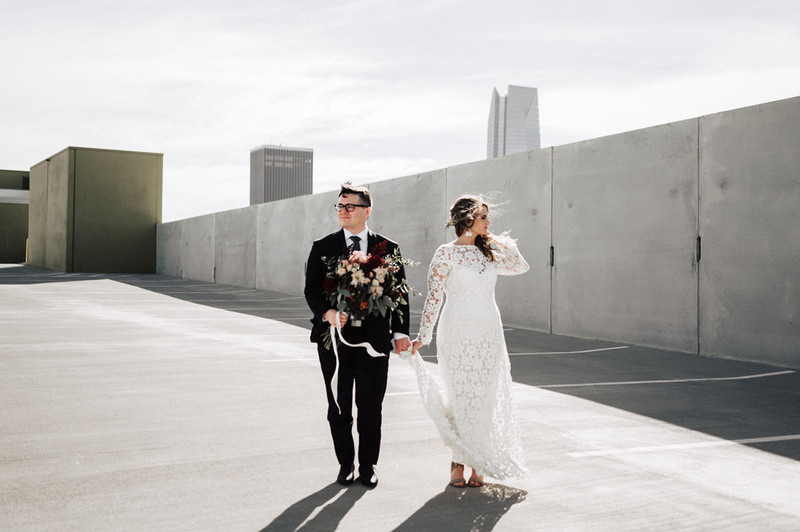 Amazing wedding photography! 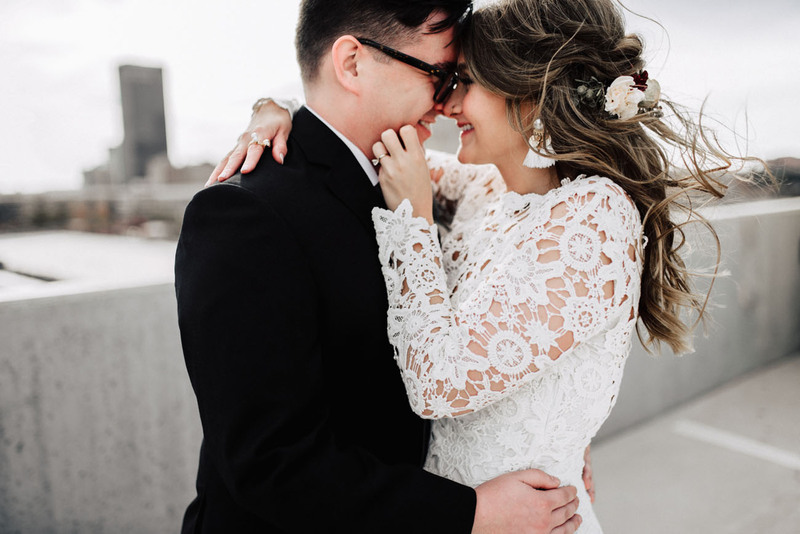 Loving the lace in her Dress ! Simply amazing work!!! Keep it up! Truly tells a story!